If you've written an email to a friend, spouse or lover, chances are you've gone through a few drafts. "How do I address him?" "Should I be so callous?" "Maybe I shouldn't close with a joke?" "How would she read this part?" "I don't want to sound flippant." "How shall I sign this?" The decisions we make, and the letter we eventually send, say a lot about us. But they don't tell the whole story. Indeed, it's the questions we ask, the rough drafts of our carefully controlled final message, that reveal a good deal about who we truly are. 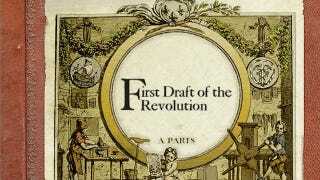 That idea lies at the heart of First Draft of the Revolution, a fantastic interactive fiction game by Emily Short and Liza Daly, made using the interactive fiction software Inkle. It's through these re-writes that we come to know the main characters, as well as their circumstances. First Draft of the Revolution is a marvel—an exploration of the space between the mind and the page the likes of which I've never experienced. Go play it!